Hello all! after much lurking and research in preparation for my first crossbow build, i decided to register and introduce myself! First, a little about me. I work as a blacksmith/ whitesmith and many other things at my job restoring and reproducing 17th century hardware. As a hobby in my spare time i am also a bladesmith. I am a fast learner, and good with my hands, which has allowed me to pick up new skills very readily. I have never had any official training besides just "doing it" and research. A few months ago i saw a mini 4" crossbow online and said, "hey thats cool.. i bet i can do that." So i did, and now.. now i want to build a medieval styled full size bow. I picked up a 3x3x3 red oak board at Lowes, and after much research i started on it this past Friday. I am planning on making a crossbow at around a 200 + lb draw, as i want to take it out hunting eventually. So far I have the roller nut and its reinforced socket built and set almost flush into the red oak post. I also have the trigger lever slot drilled, the lever set in place and tested the whole thing for functionality. 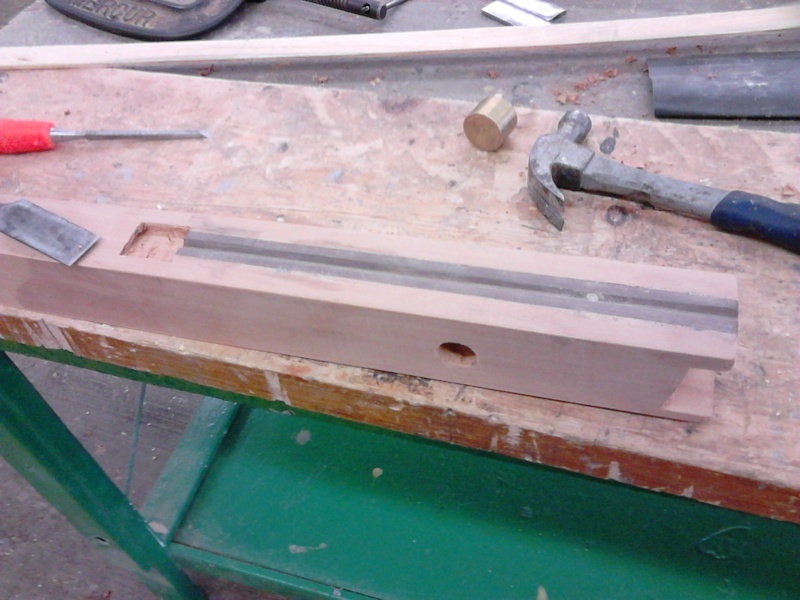 I need to mill the slot for the bolt to rest in and i may trim the sides back so the tiller is not so wide. After that, i plan on purchasing the prod and bow irons. I could make them, but i figured for my first crossbow i would rather be safe than sorry, and get it professionally done. On that note, I was planning on ordering the parts from alchem, are they still in business? Sorry for such a large introduction, I hope to learn a lot from everyone here as i progress with this project! Hope you all have a good evening. I shall finish this up with the few pictures i have so far. Welcome to our wacky world! Great looking beginning. Is that roller nut assembly milled from aluminum? I've heard there can be problems with aluminum 'sticking'. You want want to Search here and see what has been written. I have to say I admire the heck out of any metalworker... just not something I ever had the opportunity to learn. I'm a woodworker, myself. AFAIK, Alchem is still in business -- slow but still in business. Certainly that 3x3 can be shaped to reduce half the mass, at least, while retaining all the needed strength. It is entirely mild steel actually. 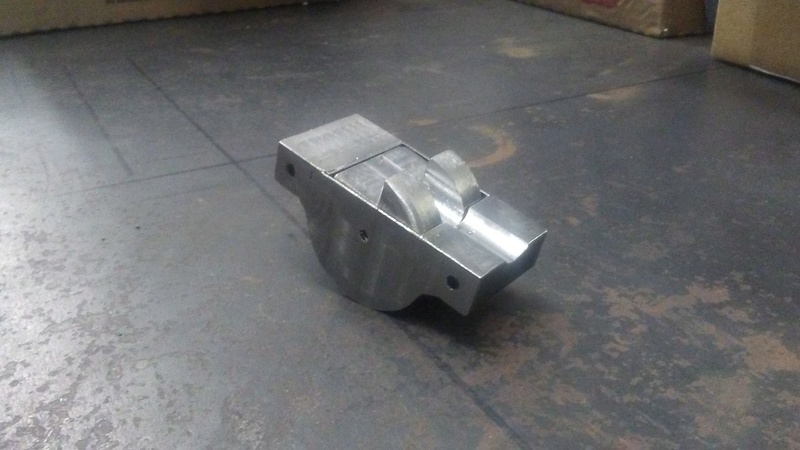 I basically followed the guidelines on the wiki, then milled the mug welds off nice and clean. I have been debating on switching out the mild steel nut for a delrin one. What I will probably do is make one of delrin and test the both out when this thing is completed. And thank you! I admire all woodworkers, working with a chisel scares me. After getting used to working steel wood seems to move entirely too easily. Thank God, people can join again!! Yo Cscott if you made a tiny crossbow show us, by the way dont be afraid of using a chisel its easier than you think. Welcome. Your work looks very promising so far, can't wait to see how it goes. Hello all! I finally received my prod from alchem, so I am now ready to continue this project. Before I do so however, I have a question. 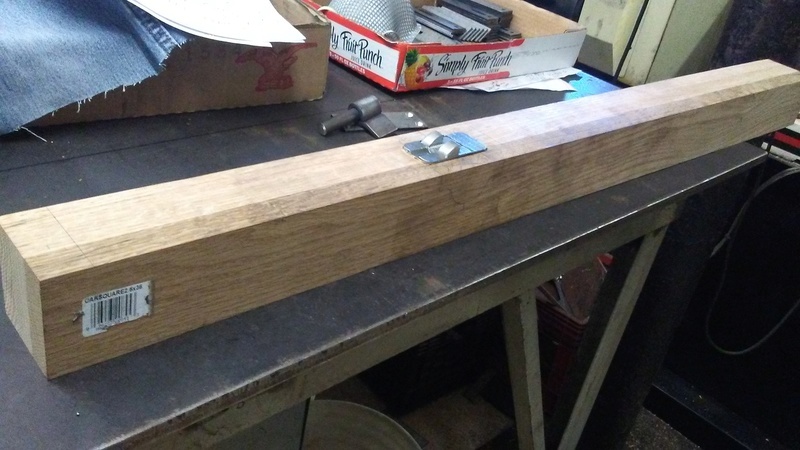 I just now realized that since I used 2.5 x 2.5 square oak, once I cut my slot for the prod I will only have 3/8" of wood remaining above and below the prod. Is this going to be a safety issue? 3/8 in. top and bottom should be just fine. That's what I use. Geezer. So I have some work done! The wood has been cut and shaped, and I am now fitting the prod to its space. I have also read somewhere that it may be a good idea to put a reinforcing screw or bolt to protect against the bow irons splitting the tiller. Is this just a large screw or carriage bolt run up from the bottom behind the wedges? Ok, so I will thread a bolt in there next time I work on this. Thank you for the quick response! So I was able to work on this most of yesterday afternoon! Here is where we are currently. This prod is the heaviest weight that alchem offers, so my next step is to make a goats foot. I couldn't find any guides for making one, so I'm just going to be going off of pictures. Does anyone have any advice or other useful information that could save me some wasted time and effort? I am really itching to shoot this thing! A goat's foot? There's quite a good pattern in Payne Gallwey's " Book of the Crossbow". (originally published as "The Crossbow, medieval and modrn." Also, you might want to send an enquiry to Darkwood Armory. They sell some crossbow parts and have been known to make gafas/goatsfeet or parts thereof. By the way, your work looks very nice. I particularly appreciate the correct 'plough' trigger. Geezer. Why thank you! I actually work as a blacksmith making and restoring antique17- 18th century hardware. So I just forged it until it looked good to my eye. You have a fullly mortised lock, with no cutting through either side, so your stock should be pretty secure to begin with. However, I've never seen a stock in this pattern (mid-to late 15th century German) that didn't have some sort of lockplate, so why not be safer than sorry? Geezer. So is 1/8th of an in substantial enough considering your previously mentioned points? Tomorrow I need to clean up the hooks and connect them, then mount the handle. Once that is done I need to make my plates and install the pin for the goats foot. So she shoots! The bolts are not stabilizing though, the tail end is kicking around in a circle. I need to make another 1/2 bolt slightly longer, and a few at 3/8ths and see what happens. The broadhead, interestingly enough, just goes straight down after leaving the bow, despite the head being lighter than the bodkins. If your bolts are whirligigging or yawing, there are two possibilities: either your fletching is off or you are not getting a clean push with your prod. The prod might be a bit off center or crooked in its mounting (check with a carpenter's square) or alternatively, you might be pulling the string off center. One of those should take care of your bad flight. Geezer. Cscott, I noticed that you mentioned your broadheads fly different . If they are a fixed design they most surely will. You have to remember that you have steerage on both ends. The blades will grab air ,just like your feathers do. A common way around this is to use what is called a mechcanical head, where the blades fold up, and open upon impact.These cause awesome damage, but are rather expensive.These will fly like a target point. So a question about broadheads,should they be mounted on the same plane as the fetching?Or opposite? hello C scott, I've been shooting and hunting for over fifty years. Just recently with the crossbow ,cause I like making them. I would use a postition that gives you the best clearance on your stock. I've never seen an advantage one way or another.I will say the mechanical heads I mentioned do fly just like your target points cause, when they are folded,they pretty much are a target point. A word of caution on them though.They are not a cure all,you need a heavy fast shaft to make them open properly. You need the kenetic energy and shorter shots.